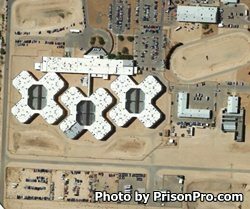 Rogelio Sanchez State Jail, sometimes referred to as Sanchez Unit, is a minimum security jail located in El Paso Texas. The facility houses J1 to J2, and G1 to G2 offenders, as well as inmates who are currently in transit or have a transient status. The maximum capacity of Sanchez Unit is 1,100 adult male offenders. Sanchez State Jail operates a facility garden that is maintained by select inmates, additionally this unit is responsible for the care of dogs who specialize in scent tracking and detection. Inmates at Sanchez State Jail are provided classes in adult basic education, literacy, and can take GED classes during their incarceration. Vocational skills taught to inmates include carpentry, culinary skills, heating, ventilation, air conditioning and refrigeration. Additional programs provided to offenders include, substance abuse education, life skills courses and CHANGES which is a pre-release course that helps prepare an inmate for their upcoming release. Inmates who are incarcerated in the Sanchez State Jail are permitted visitors on Saturdays and Sundays from 8am to 5pm. All visits, with the exception of "special visits," are limited to a maximum of two hours in duration. Visiting ends promptly at 5pm, so do not arrive at the unit during the last hour and expect to have a two hour visit, or even be processed. Visitors may bring a small clear Ziploc bag with up to $20 in quarters to purchase items from the visiting room vending machines, paper currency is not permitted.